Located in the cool heart of the Anderson Valley, along California’s windswept Mendocino Coast, Split Rail is the most recent addition to our collection of estate vineyards. With a varied topography of undulating slopes and benchlands, 16 distinct blocks of Pinot Noir and nine different clones, it is also one of our most diverse vineyards. 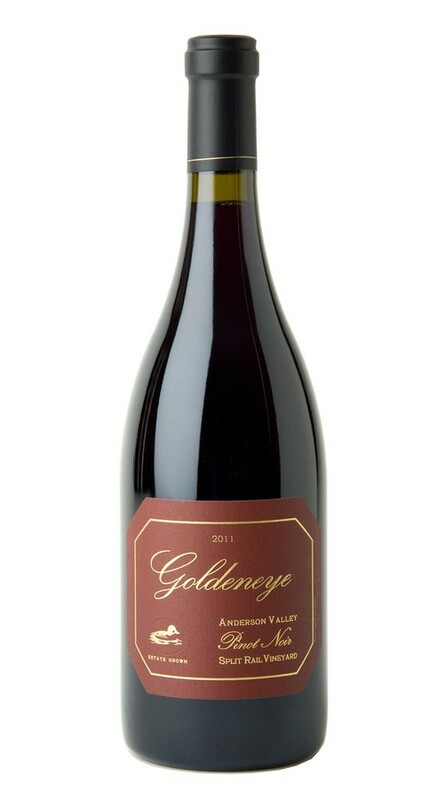 This diversity contributes to a complex and nuanced expression of Anderson Valley Pinot Noir that balances focused red fruit elements with impeccable structure and depth. From its gorgeous brick red color to its woodsy nose of spicy anise, wild red berries and fennel seed, this is a beautifully structured Pinot Noir. On the palate, sweet, ripe tannins support lush red fruit and cherry layers, as well as enlivening hints of watermelon, mint, and gumdrop spice that add nuance and complexity. The 2011 growing season was the coldest in the 15-year history of Goldeneye. In the vineyard, we benefited from our experience as cool-climate winegrowers, and the exacting control we are able to apply to our Estate vineyards. We adjusted practices to compensate for the weather, with extra leaf pulling and vineyard-floor cultivation. We also did extensive fruit drops in multiple passes to encourage complete ripening with overall yields of approximately 2 tons per acre. The long, temperate season allowed for extended hang-time, and the majority of our grapes were harvested before the rains. The resulting wines are bright and elegant with slightly lower alcohols, lovely aromatics, natural acidity and pure fruit flavors.